Raymond mill is a traditional mill type, which is to grind non-flammable and non-explosive materials in the fields of building materials, mining, metallurgy and chemical industry with hardness less than 7 in Moh’s scale and humidity less than 6 percent, such as: limestone, calcite, barite, dolomite, marble, talcum, gypsum, kaoline, iron ore, glass, fireproof materials, heat preservation materials, chemical materials and so on( about 300 kinds of material). The granularity of the end products can be adjusted from 30 to 325 meshes. 1. The equipment's structure is tight, from crushing to grinding and packing all together forms an independent production system, it has advantages of covering small area, operating simple, saving work force. 2. The final product has high passing screen ratio, which can achieve 99%. 3. Driving system of main frame adopts airtight gearing and pulley, which secures reliable operation. 4. Main parts of the grinding plant are made from cast and high quality steel, which ensures the durability of whole plant. 5. With application of centralized controlling electric control system, no operator is in the operating room. 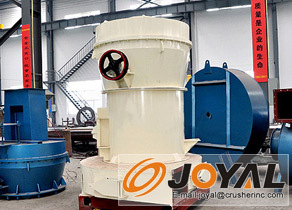 Detailed:Materials first enter jaw crusher to be crushed to smaller size. Then they are lift to storage room by elevator. Vibrating feeder will feed materials into grinding room evenly. When the materials are put into the grinding room of the main equipment, the grinding roll swings outward and presses closely upon the grinding ring due to the centrifugal force in rotation of the main shaft. The shovel carries materials to the space between the grinding roll and grinding ring, and materials are ground as the grinding roll rolling. After being ground,the qualified powder is selected by Separator via the cycle wind of the blower and the rough powder will be back to the grinding room for regrinding. The qualified powder is brought into the powder collector by airflow. The powder comes out as end products.